You’ve probably heard of messages/teachings on the battle between good and evil, the devil and God for the souls of man or something on that line. The truth of the matter is, it has never been a battle between God and the devil. When the devil rebelled in heaven, He got kicked out with some of his angels being held by chains in darkness awaiting the final judgement (Isa 14:15 Eze 28:16, Jude 6). Like we’ve said before God used the devil for the establishment of His grand purposes and since the fall of man in the garden, the battle has always been between the devil and man (through Jesus) for the dominion of the earth. The first Adam lost the dominion of the earth to the devil and the last Adam came and got it back (Luke 4:6-7, Matt 28:18). But in order for the eternal purposes of God to come to pass as planned, the last Adam left the earth and has delegated His authority to man. These includes your works, businesses, successes, plans, dreams, aspirations, etc, you name it; no matter how noble, good, beneficial or successful it might look in this age, If it’s not of God, it will not endure, it will be destroyed in the end. 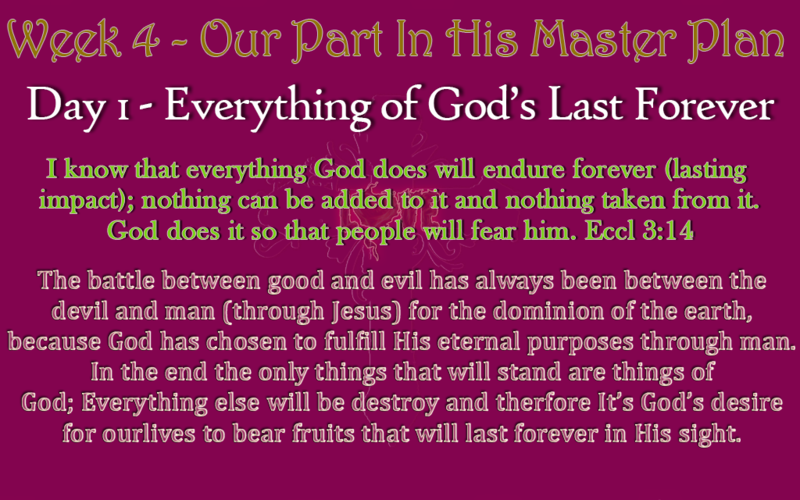 The only things that will be left standing are things of His purposes. This is what Solomon meant in the scripture above. I’m convinced of this that we’ll all be shocked to see that many things of today (including creative businesses and innovations) would still be used in the age to come. Simply because they were God’s ideas put into people’s heart to bring them to pass in this current age and since they’re of God, they will last forever.